I’ve never heard of an overweight caveman. Now whether it’s because they had to wear those terribly revealing loincloths (basically bikini season year-round), or because their careers involved clubs and rocks instead of charts and graphs, I can’t say for sure. What I do know is desk jobs don’t encourage a healthy lifestyle. In a recent CareerBuilder.com survey, 49% of office workers said they gained weight at their current jobs, and 28% of those packed on more than 10 pounds. But don’t fret. Women’s Health Magazine has come up with a bunch of tips on how to stay Stone Age slim in your suit. Sweet Success One of the more interesting tips had to do with smell. Apparently, the key to weight loss success is a Glade plug-in. A group of overweight people who smelled sweet smells (green apple, peppermint, vanilla, or banana) when they were hungry lost an average of 30 pounds in 6 months. 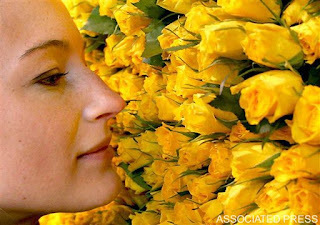 Experts believe the scents suppressed rather than stimulated appetites. So grab some potpourri and see. Green isn’t just for Mother Nature. Grab a cup of green tea and you’ll improve your chances of losing weight. A study in the American Journal of Clinical Nutrition found people who drank oolong tea with green tea extract for three months lost 2.4 more pounds than people who drank just plain old oolong tea. Catechins, antioxidants found in green tea, may stimulate the body to burn calories and decrease fat. This is a weird one, but it sounds kooky enough that it might just be true. Women’s Health says if you have a snack stash, keep it in a left-hand desk drawer. Researchers claim we're more likely to reach for things to the right of our field of vision. Do you have any office tricks that work for you? This entry was posted by kate, on Monday, October 5, 2009. You can leave your response .